A total of 291 metropolitan areas -- just over 80% of all those for which data is available -- now qualify as "improving" housing markets, according to the NAHB/ First American Improving Markets Index (IMI) for September. This new record high reflects a solid gain of 44 markets from August, with 242 markets retaining their improving status from the previous month and just five being dropped from the list. While the list's dramatic expansion was partly due to a recent improvement in the way that Freddie Mac measures home prices, it is nevertheless a good sign that the ongoing housing recovery is quite widespread, with every state now able to claim at least one county that's part of a rebounding metro. A complete list of all 291 metros currently on the IMI, and separate breakouts of metros newly added to or dropped from the list in September, is available at www.nahb.org/imi. 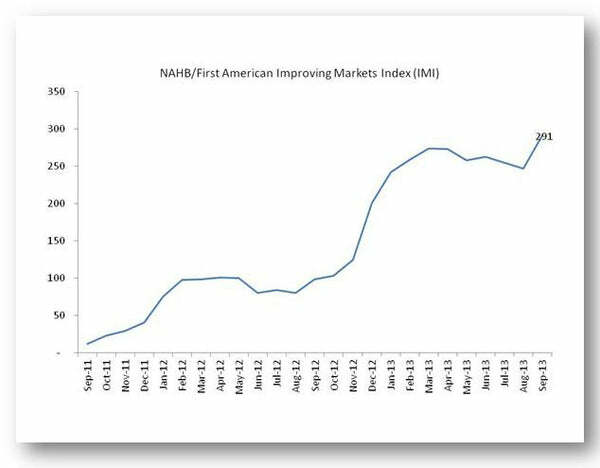 Meanwhile, now that the IMI's original purpose of spotlighting places where the recovery was starting to take hold has been fulfilled, NAHB will be phasing out this index in October and replacing it with a new index to be released on the same schedule. Details on this new index will soon be available, but we can tell you that it will shift the focus to markets that are now approaching and exceeding their former normal levels of economic progress. 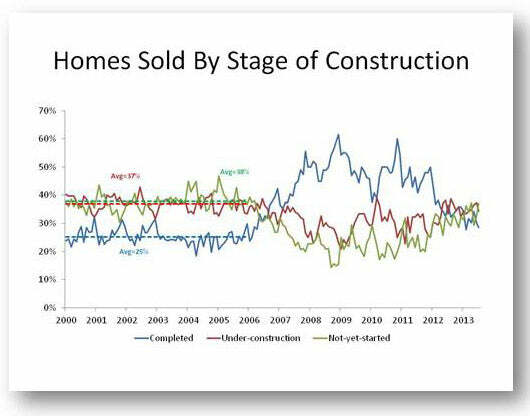 In a recent Eye on Housing blog entry, NAHB's economists describe a significant shift in the marketplace whereby greater numbers of buyers are purchasing homes that are still under construction or not yet started versus newly completed homes that are part of a builder's inventory. The experts attribute this emerging trend to several factors, including, for example, smaller inventories of completed homes (which have limited buyers' choices in that area) and also builder credit constraints that have led to a surge in construction-to-permanent financing. In any case, our economists note that the recent shift has been quite dramatic. Whereas completed homes were half of all new-home sales in 2008, by mid-2013, that average had fallen to just 29%. In the same period, the share of homes sold but not yet started went from 21% of sales to 37% and the share of homes sold that were under construction went from less than a quarter of the total to more than one-third currently. One likely explanation for what seems to be a long-term trend in favor of sales of unfinished homes is the rise in concentration of larger building companies, which can hold an inventory of models and available lots for buyers to choose from without having to risk building ready-to-occupy homes that might not fit buyers’ preferences. Today's house plan is Archival Designs' Luxury Retirement/Starter Home, Mayberry Place.